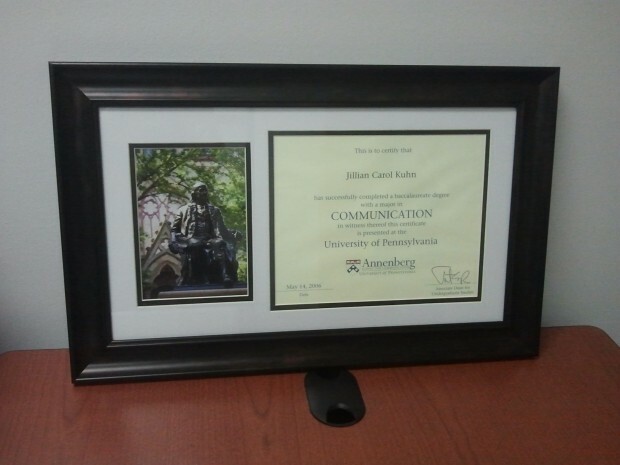 I thought my new office needed a little sprucing up, so I customized this frame for my Communications graduation certificate and will soon be hanging it on the office wall. The Annenberg School of the University of Pennsylvania awards these to graduates with an undergraduate major in Communication. While I quickly got a nice frame for my University diploma, my major certificate never got the same attention. It had been sitting around my house in an old frame but definitely deserved something a little nicer! First, I bought this dual-photo frame from Michael’s. It’s typically used to showcase graduation or youth sports photos. Then, I downloaded the Ben Franklin statue photo from the Penn Campus Photos page (courtesy of my friends at the Penn Web Team!) and ordered a print from an online photo service. Voila! Gorgeous customized diploma frame!